What would you bring with you on an expedition into a cave system? Food? Water? A torch? A friend to talk to so you aren't driven mad by the eternal echo of solitude? No. You need legs. Long, long legs. Legs on stilts. That, at least, appears to be the Cave Cricket's answer. You can see why they're also known as Spider Crickets! It's not quite so obvious why another name for them is Camel Cricket. Although, yet another name is Camel-backed Cricket and yet another one is Humpbacked Cricket. So I guess that's it. They're hump-backed, like a camel hump. Although, to me they look less hump-backed and more like just a hump. Like a camel's hump grew legs and ran away. Maybe that's where llamas come from. You have nothing to fear but fear itself. Honest. 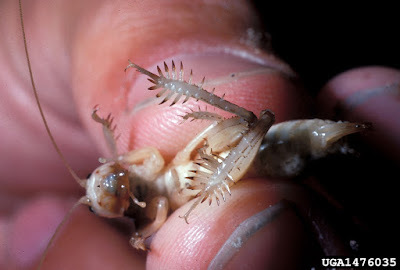 And, just like llamas, Cave Crickets are completely wingless and extremely leggy. The lack of wings means they can't sing, shrill into the night like other grasshoppers and crickets. They can't fly, either. They can sure jump, though! And with those huge, powerful legs of theirs they can jump really far, too. They don't always jump away, either. 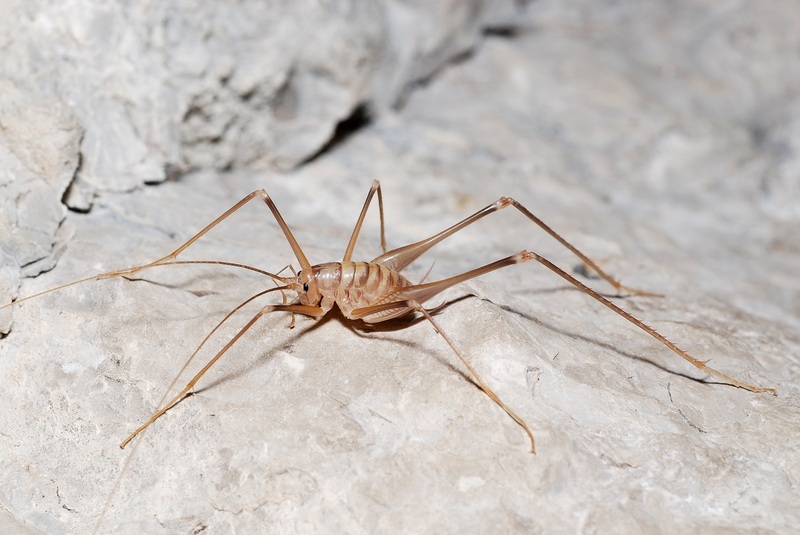 Whether due to confusion, poor eyesight or a deep understanding of how the world sees them, Cave Crickets often make full use of their creepy, creepy crawliness and jump right at predators and any lumbering beasts who may blunder into them. 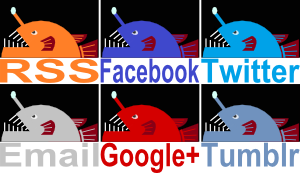 If its effect on humans is anything to go by, it seems to be an extremely effective strategy. Even the most ardent of insect lovers can be reduced to a trembling wreck after the startling leap of a big Cave Cricket. Some of these things can reach 5 cm (2 in) long, after all! And that doesn't include legs that can be twice as long as the rest of their body. Cave Crickets are so big that in New Zealand they've become what we might call 'honorary Wetas'. 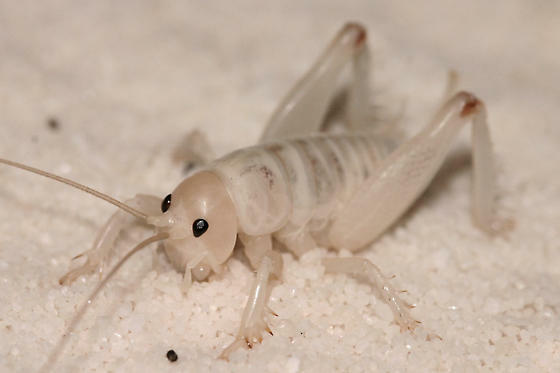 They're not closely related to any of the other great, big crickets known as Wetas, but they're great, big crickets in their own right so they get called Cave Wetas. 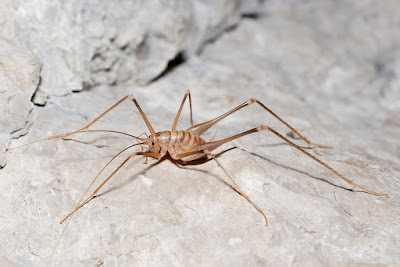 There are lots and lots of Cave Cricket species in the world, all belonging to the family Rhaphidophoridae. They're mostly found in temperate regions in the northern and southern hemisphere, avoiding the tropical bits in between. Even the Australian species are only found in the more temperate, southern coast. Many Cave Crickets live up to their name quite well. They like caves! There's even a genus called Troglophilus, which means 'cave lover'. Gotta love those caves! Especially if you're going to live in them. You can save a lot of money on holidays if you just love the cave you're living in. 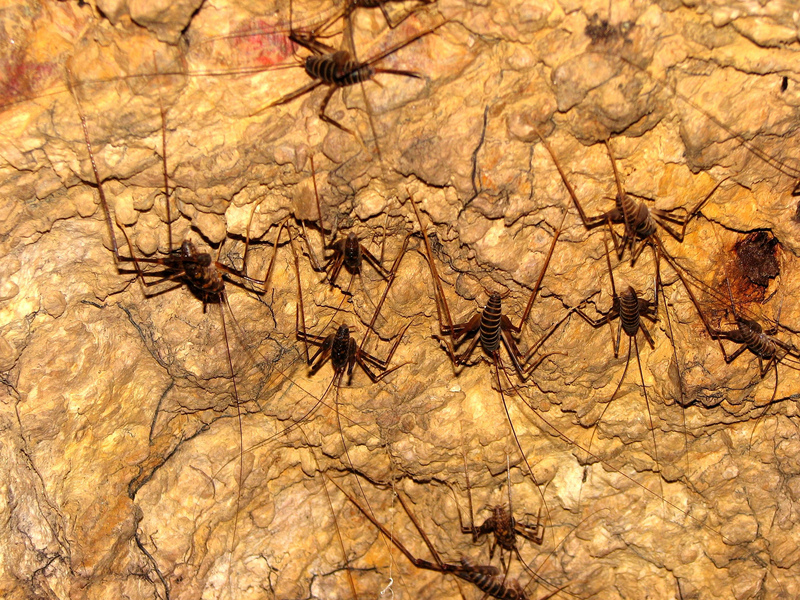 Having said that, a lot of Cave Crickets do in fact leave their caves regularly. I can't even find any who go full on 'cave look'. They all have eyes, for a start. And while some are paler than others, I haven't found any with the ashen pallor of the true troglobite. 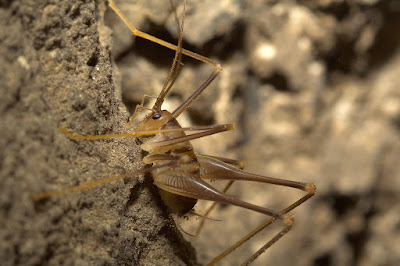 Instead, Cave Crickets tend to have more of a 'cave's mouth look'. They escape the dangers of the daytime by delving into the cool, damp, darkness of their caves. Once night falls, they emerge to forage for food. They'll eat almost anything, from rot and fungus to the bodies of the dead, so they may find all they need at the entrance of the cave. If not, they'll happily walk out into the surrounding forest to feed. In smaller caves, these adventurous crickets can end up being THE major bread-winner for the entire cave community. They go out, gather food (in their stomachs by eating it), bring it back home and deposit it in the form of droppings and dead bodies. Or themselves, if any cave spiders can catch them. Darn spiders. Is my faeces not good enough for you? So Cave Crickets are very much at home in darkness but they still have some use for those eyeballs. Eye facets. 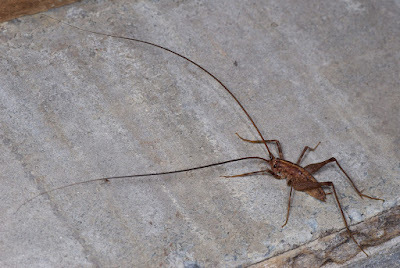 But they also have use for long, feely legs and long, feely antennae, so they have those, too. 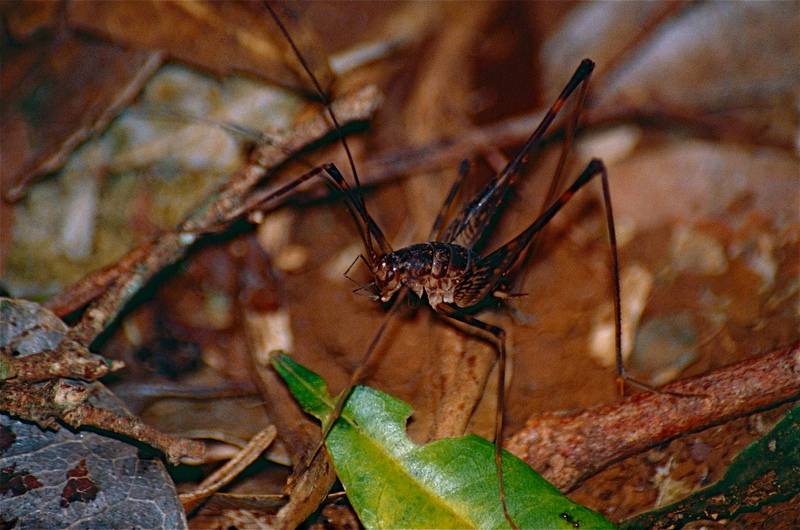 However, not all Cave Crickets live in the palatial surroundings of damp, dark caves. Some modestly settle for damp, dark leaf litter or damp, dark areas underneath stones. They like it damp and dark, you see. And that can be a problem. Not for Cave Crickets, but for people. Do you have a basement? Is it damp and dark? Be honest! Is it full of mould and dead bodies? Come on, now. Tell the truth, Godammit! WHERE DID YOU HIDE THE BODIES? Sorry, I got carried away there. But a damp, dark basement is good living for a Cave Cricket. They don't even have to stay there all the time. If there's a little hole somewhere that leads outside they can pop out every night to feed and come back before morning. On the other hand, they may not even need to leave the basement to eat. After munching through the mould on the walls (you really should clean that place up) they may well turn their attention to any fabric, carpet or paper they can find. Some species within the Rhaphidophoridae family are better known as Sand Treaders. They live in dry, sandy areas like the deserts of California and Colorado. And their rearmost legs have peculiar spikes sicking out of the sides. Why, you ask? Because it helps them dig through the sand! And why would they do that? Because its so much darker and damper beneath the surface than on it. 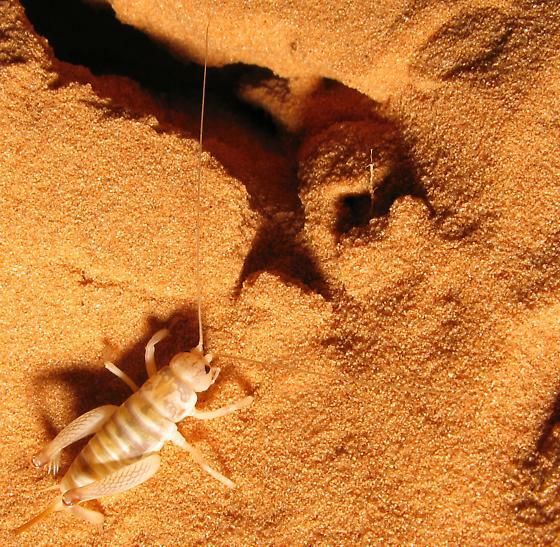 Instead of spending their days in caves and venturing out at night, Sand Treaders spend the day burrowing beneath the desert sands and venture up to the surface to forage for food at night. At last, the true Camel Crickets! I live in a basement, but I don't worry about crickets. I have spiders, yay! But so far I have been unable to train them to clean up the mold. Working on it. Uh oh, sounds like your basement has a top heavy food chain! 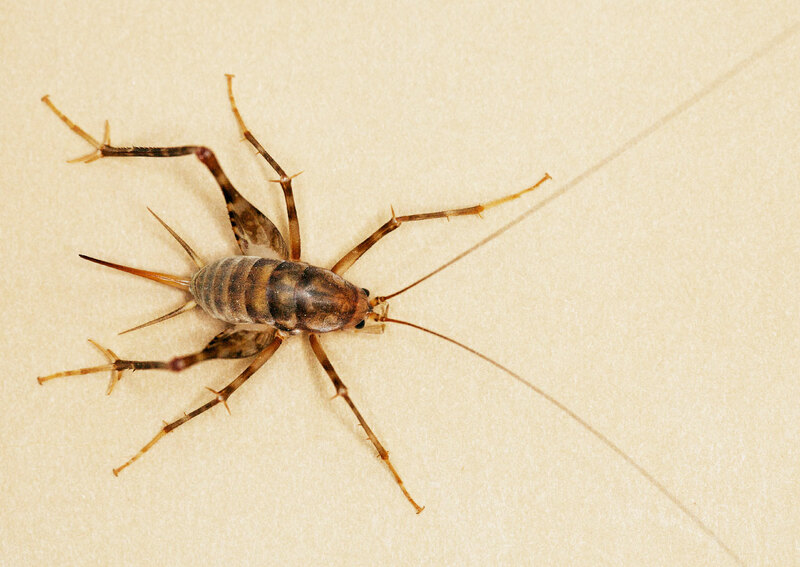 Yay, cave weta! Even though they are weta pretenders, they are still pretty great, in my opinion. Yup, great and big. Great, big crickets!